Marking its first presence on the Eastern coast of Thailand, The Ritz-Carlton Hotel Company, L.L.C. announced the newest addition to its collection of properties with the opening of The Ritz-Carlton, Koh Samui. Located on the tropical island paradise of Koh Samui on the Gulf of Thailand, The Ritz-Carlton, Koh Samui combines the brand's legendary service with the traditional spirit of Thai hospitality and colorful Samui island life culture. "Known for its charm and pristine natural beauty, Koh Samui is a favorite destination for travelers. An island sanctuary amid breathtaking and diverse beauty, this resort is an exceptional blend of both The Ritz-Carlton and Thai cultures and fulfills our mission to offer inspiring new memories in sought-after locations," said Hervé Humler, President and Chief Operations Officer, The Ritz-Carlton Hotel Company, L.L.C. "We are confident that The Ritz-Carlton, Koh Samui will make a valuable contribution to the long-term success of this destination and enhance the memorable travel experience for guests from around the world." The Ritz-Carlton, Koh Samui offers 175 suites and pool villas nestled amid 58 acres that overlook the waters of The Gulf of Thailand. Built on the site of a former coconut plantation, the resort pays homage to its past through the extensive use of coconut and other natural materials such as ceramics, touches that imbue a sense of place and help immerse guests in their destination. The oceanfront resort features Spa Village Koh Samui, a 3,800-square-meter haven anchored in the healing culture of the region, complete with eight treatment suites, three massage pavilions, a yoga pavilion, health bar, and a lap pool with intimate cabanas. The hotel's culinary offerings reflect Koh Samui's destination across seven dining experiences including Pak Tai, offering fine dining interpretations of traditional southern Thai cuisine with views over the swim reef from its secluded individual dining terraces. Additional venues include Shook!, a stylish interactive dining space serving innovative Asian and Western dishes complemented by a superb selection of fine wines; Sea Salt, offering international classics and Thai favorites in a relaxed dining atmosphere; and Tides, an ideal spot for sun-lovers to unwind with a refreshing cocktail from the poolside bar and enjoy a citrus-cured specialty from the cevicheria. With its circular bar and lounge, One Rai offers cocktails and Asian-inspired small bites. Additionally, on select days guests can enjoy Baan Talat, an outdoor food market experience with street food stalls, dancing and crafts. To further draw guests into the local culture, The Ritz-Carlton, Koh Samui has curated some of the best authentic southern Thai experiences to explore and experience, including the Muay Thai Gym with its indoor kickboxing ring, where guests can learn the martial art of Muay Thai (or 'The Art of Eight Limbs') with trained instructors. Additionally, guests can sign up for a journey to a local market to source seasonal produce, followed by a class to unlock secrets of southern Thai cooking. The Ritz-Carlton, Koh Samui also offers a one-of-a-kind temperate Swim Reef within the resort that teems with over 50 species of fish. It is the largest of its kind in Southeast Asia, and offers unique snorkeling and fish-feeding experiences. The Swim Reef also features expansive facilities including two white sand beaches, a beach-side resort pool, a water sports center and two floodlit tennis courts. The Ritz Kids program, with dedicated kids check-in and amenities for children, offers indoor and outdoor activities helping to strengthen family ties through shared moments. This resort also makes each wedding is a signature event. Offered in either Thai or Western style, lifetime vows are exchanged at Sala Thai, an elevated pavilion overlooking the Gulf of Thailand. 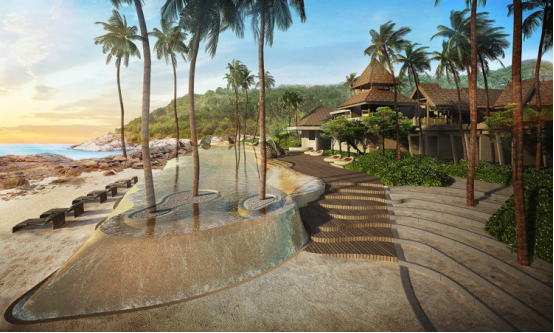 The opening of The Ritz-Carlton, Koh Samui affirms the long-standing partnership between Marriott International and YTL Hotels, which owns the property. "The Ritz-Carlton, Koh Samui marks another milestone of our strong partnership with Marriott International. With the opening of this hotel, our portfolio, together with Marriott International, now encompasses nine properties across Asia-Pacific and Europe," said Dato' Mark Yeoh, Executive Director of YTL Hotels.